Jell-O is “America’s Most Popular Dessert”—just as a 1904 ad campaign paid for by Jell-O told us. Let’s delve into some of the history and mystery behind the wobbly treat. 1. It’s a few steps removed from cough syrup. Jell-O’s inventor hit upon the first successful gelatin dessert recipe in the course of his side work as a manufacturer of patent medicines like cough syrups and laxatives (he was a carpenter by trade). In 1897, LeRoy, New York resident Pearle B. Wait and his wife, May, added strawberry, raspberry, orange, and lemon flavoring—probably because they were already on hand from Pearle’s medicinal concoctions—and the original four flavors were born. 2. It’s loaded up with the sweet stuff. Gelatin without the fruit flavoring is a translucent, tasteless mass, and it takes a lot to change the flavor. The Waits’ delicious dessert required 88 percent sugar to become palatable, taking it about as far from the realm of medicine as possible. 3. Jell-O succeeded in the market by sheer force of will. Lackluster early sales could have spelled certain doom for Jell-O. After spending over a year attempting to sell Jell-O door to door, Pearle Wait gave up. The disheartened inventor sold his trademark and recipe to neighbor Orator Frank Woodward for just $450. When Woodward’s initial luck was just as rough as Wait’s, he tried and failed to sell the business for $35. Luckily for Jell-O fans, Woodward was unwilling to let his investment go gently into that good night, and launched an aggressive marketing campaign featuring illustrated ads in Ladies Home Journal, well-dressed salesmen offering free samples, and recipe books targeted both to homemakers and military men. His efforts paid off handsomely, and his Genesee Pure Food Company eventually became the Jell-O Company. 4. Jell-O may have been many immigrants’ first taste of America. At the turn of the 20th century, as Ellis Island saw an influx of immigrants, the Genesee Pure Food Company saw an opportunity to convert them into loyal customers. Those tired, those poor, those huddled masses yearning to breathe free were all gifted a complimentary bowl of Jell-O upon their arrival, because nothing says, “Welcome to America!” better than a wiggly pile of unnaturally bright, fruit-flavored mystery substance. 5. It’s definitely not vegan. Jell-O is made with gelatin, a processed version of the collagen protein found in the connective tissue of animals (including humans). It’s the same stuff that makes any soup with animal bones in it take on a jelly quality when cooled, and it can commonly be found in gummy bears, marshmallows, and easy-to-swallow pill coatings. 6. Some flavors are best forgotten. Coffee- and chocolate-flavored Jell-O have come and quickly gone, because some tastes simply don’t translate very well to jiggly translucence. The savory Jell-O craze of the 1950s also saw the introduction of various vegetable flavors, including tomato and celery, but those have also gone to their wiggly graves. 7. It can serve as a weight-loss aid … kind of. Actor John Malkovich claims that he put himself on a severely restricted diet of nothing but Jell-O for four months as an overweight teen and emerged 70 pounds lighter. While it’s true that Jello-O is low-calorie, fat-free, and occasionally sugar-free, it’s also free of, well, any nutritional value whatsoever—don’t try this diet at home. 8. Utah loves the stuff. In 2001, it was revealed that Salt Lake City had the highest per capita Jell-O consumption in the world. To honor this, officials dubbed Jello-O the official state snack. 9. Love it or hate it, everyone knows about it. Jell-O has 99 percent brand recognition in the U.S., which is to say that in any given group of 100 Americans, only one of them will have no idea what Jell-O is … and the other 99 will probably be quick to explain. 10. Simplicity is a selling point. Pre-made Jell-O sold in single-serving cups is among the ultimate convenience snacks, as evidenced by its continuing presence in children’s lunch boxes—but even the powdered mix is a snap to make. In fact, early ads for Jell-O proclaimed, “A child can prepare it,” although most parents probably weren’t wild about leaving kids alone in the kitchen. 11. It’s big in Hollywood. Cecil B. DeMille’s 1923 Biblical blockbuster, The Ten Commandments, depicted Moses parting a Red Sea made of Jell-O. 12. It has its own commemorative week. The second full week of February is International Jell-O Week. Break out the decorative molds and have a party. 13. It found new life in the 1990s. After peaking in the 1960s—The Oxford Companion to American Food and Drink reports that in the late ‘60s American Jell-O sales amounted to four boxes per person each year—Jell-O gradually declined in the 1970s and '80s as other desserts came into fashion and Jell-O shots became bar staples. 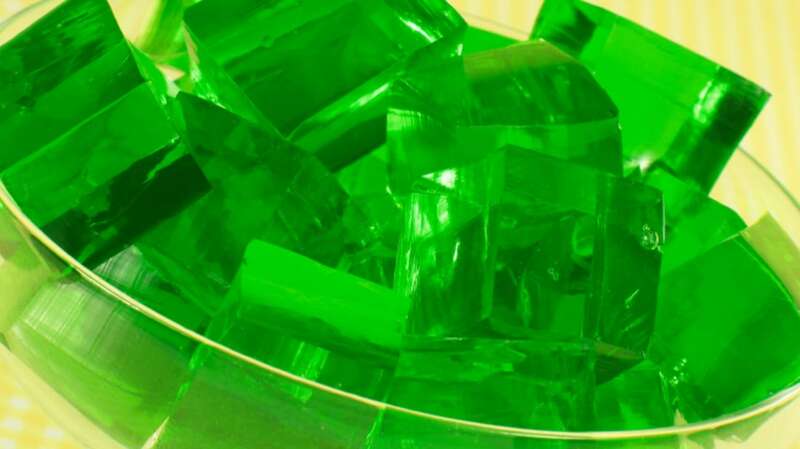 The introduction of the recipe for Jigglers, the sturdy, gummy, shapeable concoction made by quadrupling the amount of Jell-O in the recipe, led to resurgent sales. 14. It might be smarter than we think. A tongue-in-cheek 1974 experiment conducted by Dr. Adrian Upton using an EEG (electroencephalogram) machine hooked up to some lime Jell-O found that it emitted brain waves indistinguishable from those of an adult human. Of course, rather than proving that Jell-O is sentient, Dr. Upton simply intended to prove that EEG machines aren’t all they’re cracked up to be.